My husband and I took a spontaneous trip to a nearby beach a day after the type 4 (out of 5) typhoon. 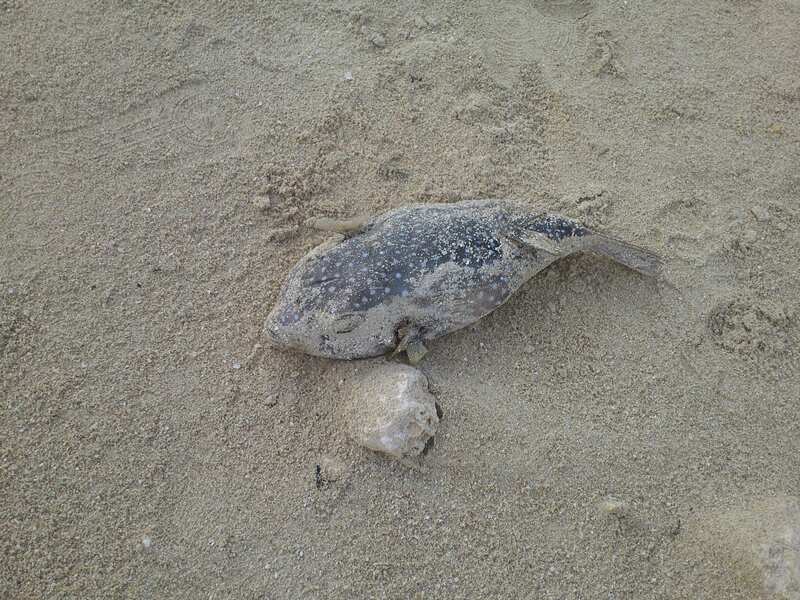 As we walked through the debris of trees from the night before, we found a few dead fish on the shoreline. One was a small flounder fish, but one fish was blue with spots. “It’s a pufferfish!” my husband exclaimed upon closer inspection. Pufferfish, or fugu, is notorious in Japanese cuisine for its poison. Chefs take around 7 years to learn how to properly remove the poisonous parts of the fish without contaminating the meat. It’s normally served as sashimi (raw fish) or chirinabe. The liver, which is where the poison exists, was banned from being served in restaurants in Japan in 1984. This entry was posted in Food (食べ物), Japan (日本) and tagged cuisine, fish, food, fugu, Japan (日本), Okinawa, poison, puffer, pufferfish, sakana, sea. Bookmark the permalink.